This is a video showing how to do stitch in the ditch with the Intelliquilter. I am no expert and was skeptical about doing SID before. 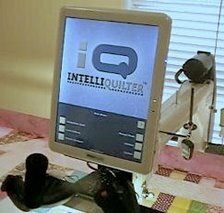 But when I decided to enter a quilt for the MQS computerized category, I realized 100% of the quilt needed to be done using the Intelliquilter. No freehand was allowed so I had force myself to use the line pattern feature to do SID work. To my surprise, I actually got quite proficient doing this. I urge all of you to at least try to do this. You might be like me and hang up your rulers for good. Set your IQ speed to .03/.03 and try to match the speed of your machine to this speed so you have the desired stitch length. Try using quilters gloves to help manipulate your fabric as the IQ is stitching. Use a very thin (50 - 70wt.) for all SID work. The stitches will not show up as much if you run onto the high part of the seam.